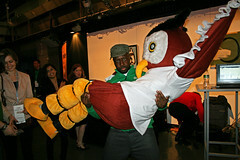 In 2009, HootSuite won “Best App” at the Shorty Awards and the executives basked in the accolades from CNN’s Rick Sanchez and Wyclef Jean among other web luminaries. This year, we hope to do it all over again and we need your help. Fortunately, @shortyawards make the process painless with a pre-prepped Twitter-sized post, with room for your reasons for voting for HootSuite.